You know those CD Towers/shelves that IKEA sells? The Gnedby units seen here? Yeah…I have four of those in my apartment filled to the gills with CDs. To say nothing of the two crates of full-sized vinyl records, as well as the separate crate of 7-inch vinyl singles, and the collection of miscellaneous odds-and-ends in my iTunes collection. 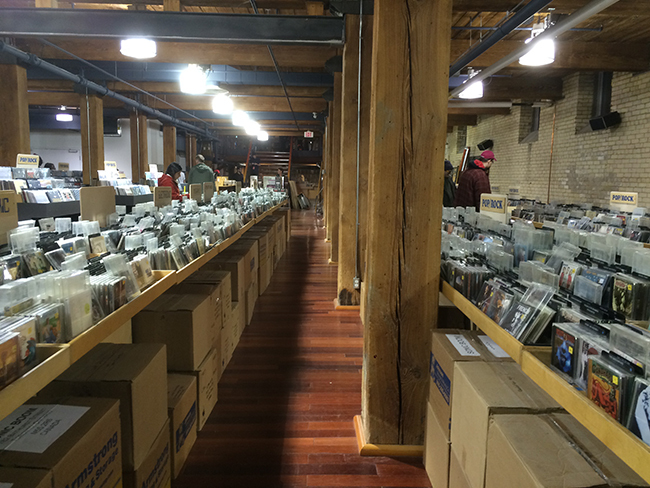 Needless to say, music collecting is a bit of a hobby of mine, and making the pilgrimage to Toronto’s Sonic Boom is my act of plugging back into the source. Sometimes I wonder if my cultural interests and I live in a bit of a bubble. In conversation with a friend recently, I expressed my recent concern over some of the cultural interests I have. Certain art, graphic novels, other literature, podcasts, comedy, and even music. I brought it up because I said I recently came to the realization that I’m a little bit sad that I don’t share my enthusiasms for these things as much as maybe I would like to. It was a long conversation with a number of psychological aspects to it, the details of which I shall spare you from, but it did help me explore the peoples and places I’m both reticent to share these, and the places I do in fact bring my enthusiasm to. I grew up an only child with very limited access to any of my extended family, so any entertainment interests I pursued were often fraught with many missteps. I think today I can say I navigated that maze of figuring out what I liked fairly well, but I didn’t have some compassionate minotaur of an older sibling telling me not to go down that dead-end hallway where Flock of Seagulls or Chumbawamba are hanging out around a campfire. The point of all this is to say that as far as being a music hobbyist, I’ve grown into my own. I’m more-or-less that person that person I want to be, fully realized and capable. When I visited the new Sonic Boom I felt a rush of ambivalence. This was a store that once occupied a space now infamously used by a Dollar Store, before moving to a much larger but as equally low-grade space inside the Honest Eds complex. But this, this new location of theirs is something else. Sonic Boom has cleaned itself up so much in having moved to this new place. With hardwood flooring through out, thick wooden pillars and beams and lighting that’s a lot more forgiving in intensity. What customers are treated to a lot more now than ever before is a rich-but-clean lived-in feeling. Such an incredible amount of detail has been put into the presentation of the place that it’s hard not to reflect upon the success that this store has managed for itself despite strokes of bad luck in the past. Walk into the store and you’re greeted with a selection of new-release vinyl straight ahead of you while all around that you’re flanked by music-related paraphernalia. 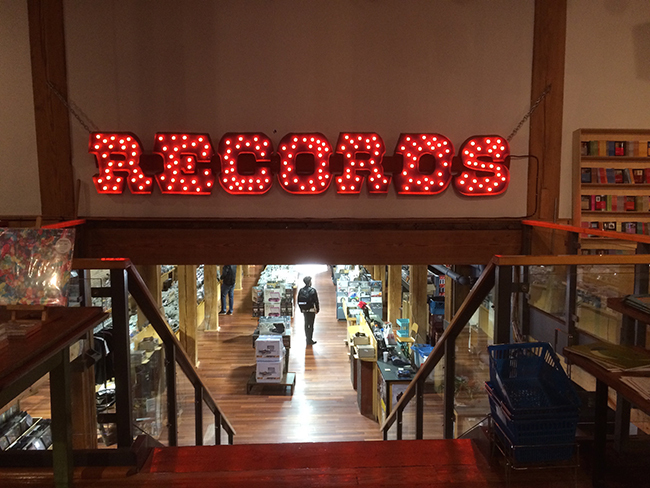 Headphones, record totes, socks with band-names written all over them, a delightfully massive corner full of books that made me giddy, an Elton John-themed pinball machine, and a life-sized animatronic bear that will literally dance to ANYTHING. Believe me, I checked. It was like staring into a Magic Eye poster or something. 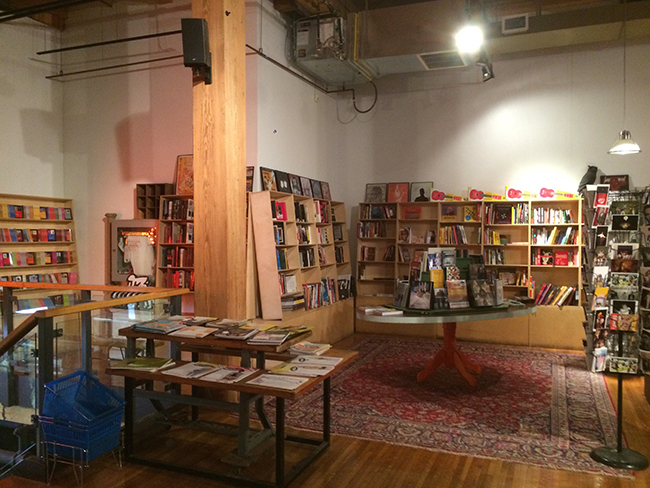 And this was all in the main entranceway occupying the entirety of the store’s first-floor space. The even more impressive feat was the plethora of CDs and vinyl stored down the main wide stairs in the basements, simply walk underneath wall where comfortably ensconced above this stockpile is a glittering sign beautiful in its simplicity, lighting the way. There it all is, miles of it, nothing and everything. Looking at it tall, the only downside that undermined my excitement was the knowledge that I saw so much potential in this store, it’s space, and especially its contents, that I knew I would be here for a while as I engaged myself in the rhythmic movements of the ensuing scavenger hunt. Clicking through CDs and shuffling up and down the same aisles repeatedly as I checked and rechecked my “to get” list of items. I was happy with Sonic Boom as it was before it moved to this new location. Upon glimpsing upon it all for the first time in its new location I was immediately proud of the place. I took in the awe of this store’s rebirth, never anticipating how great and polished and revitalized it could seem. 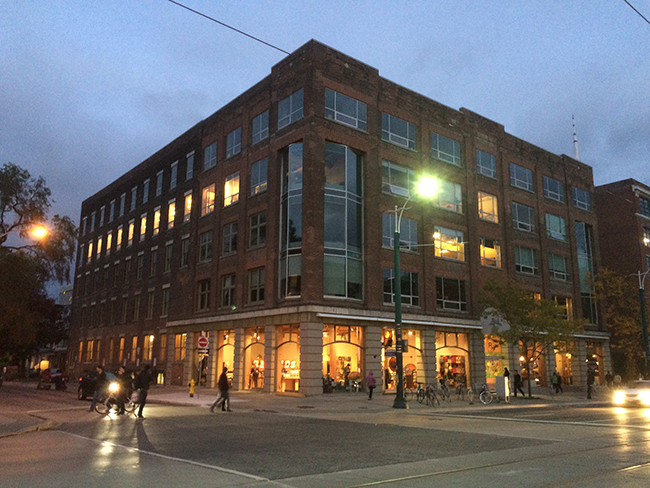 Gone are the old locations from The Annex and Kensington Market, and in their place is 215 Spadina Avenue. 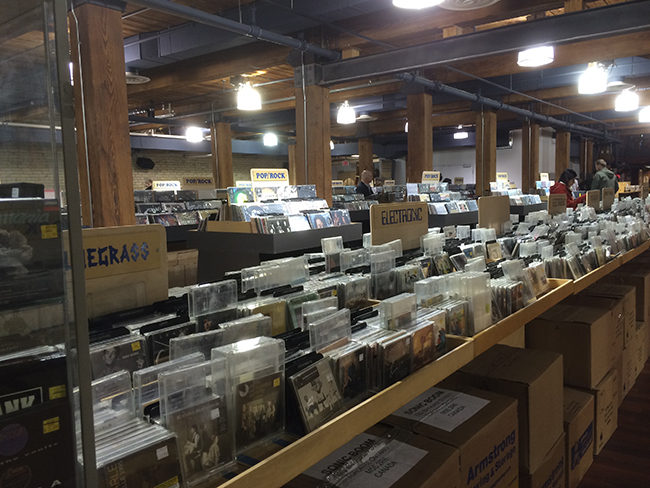 The store may be cleanly divided between music merch, CDs, vinyl, and a bountiful collection of movies buried behind the stairs, but it’s all their, a black of time and care for the outside world…exactly as I prefer my record store to be. The location is an amazing thing to behold, if you’re an individual that seeks out locations in this city that continually pushes to assert it’s own unique identity, and for fun, it would behove you to check this place out.